y8c: As the cache requires replacing and I have no time to perform maintenance, its time to archive this CM. Thanks to all that visited. Ault Hucknall is often described as being the smallest village in England with a total of three houses and a Parish Church. 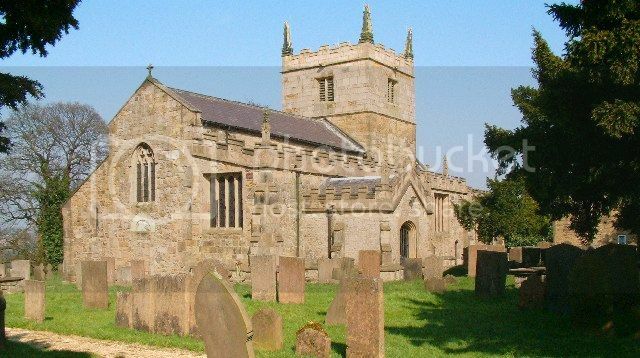 It is the St John the Baptist Church that entitles Ault Hucknall to be defined as a village rather than a hamlet - although many disagree with this definition. The church has stood on this wooded hillside for well over 1000 years, and the Doomsday book (1087) refers to the existence of a priest resident in the parish. Ancient parts of the church include the beautiful narrow arch between the chancel and the sanctuary, the two large arches to the north aisle, a small loop window in the north wall and the large arch between the nave and chancel. The carvings on this arch, it is claimed, portray the creation, the fall of Adam, the flood and the sacrifice of faith made by Abraham. The Savage window in the Cavendish Chapel dates from 1527. Also in this chapel is the tomb of Ann, 1st Countess of Devonshire and the black marble slab covering the remains of Thomas Hobbes, one of Englands great philosophers and secretary to successive seventeenth century Earls and Dukes of Devonshire who died at Hardwick in 1679. Outside on the west wall is a blocked door with a large tympanum and lintel. The tympanum is carved with the legend of St Margaret of Antioch with the Agnus Dei and a small animal. The lintel portrays St George and the Dragon, separated by a cross. However according to the church booklet - 'since the character is expelling the dragon from heaven, scripturally this may be St michael the Archangel rather than St George. The combatant is in Norman armour, up to three hundred years earlier than the adoption of George as the patron saint of England,' There is more unusual stonework in the wall to the left of this. In the churchyard is probably the oldest table tomb and last resting place of Robert Nuttall and his widow. Robert Nuttall was a Cooper by trade according to Chatsworth Archives hence the tomb is carved with a representation of a collection of tradesman's tools including an axe, a hammer, a saw and a compass. It is a tabletop tomb and is located to the left of the path between the gate and the church entrance. The waypoint and cache are accessible to pushchair users, but unfortunately not to wheelchair users.